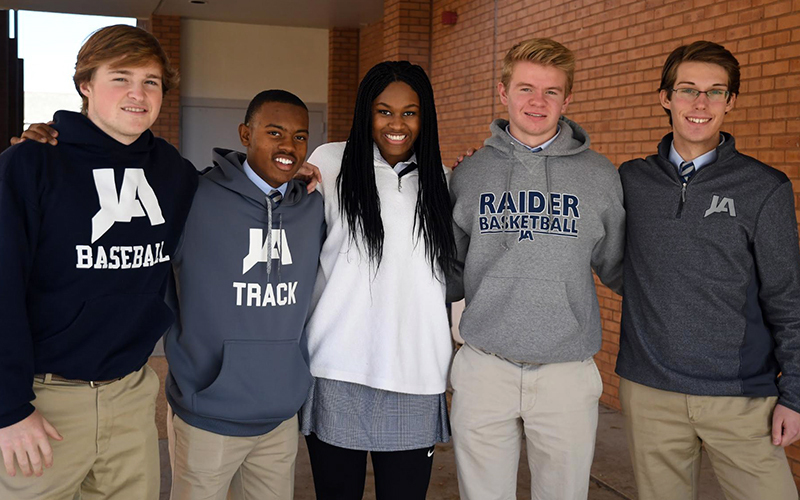 Students (from left) Garrett Clarke, Jarvon Gaines, Kelsey Ford, Max Rogers, and Elliott Butler toured several Texas universities together with Jackson Academy Counseling Department staff members. Not pictured: Sean Lackey. As their bus pulled through College Station they watched the busy pace of a college campus. It is a pace that Garrett Clarke and Max Rogers will be diving into next fall as they enter college. For Jarvon Gaines, Kelsey Ford, and Elliott Butler there is still another year and a half at JA, but college decisions already loom on their horizons. Counselors Amy Bush, Paula Pratt, and Danny Robertson led the group through its three-day tour, guiding students to ask questions and observe different schools’ cultures. “I think these kids realized, if they hadn’t before, that the town that the college is in is just as important as the college itself,” said Bush. “The surroundings and community play a big role in the campus, and vice-versa.” The students were interested in majors ranging from per-veterinary to petroleum engineering. Despite these differences, they agreed that experiencing the atmosphere and size of a campus was an integral part of discovering whether or not it was a good fit for them. For the seniors on the trip, the visit did exactly what it was meant to do: helped them move toward confidentially making a college decision. “We’re really close to deciding where we want to go,” said Garrett.